The James Byrne estate designed by Grosvenor Atterbury c. 1906 in Oyster Bay. Click HERE for more on the Byrne estate and what would become 'Planting Fields'. 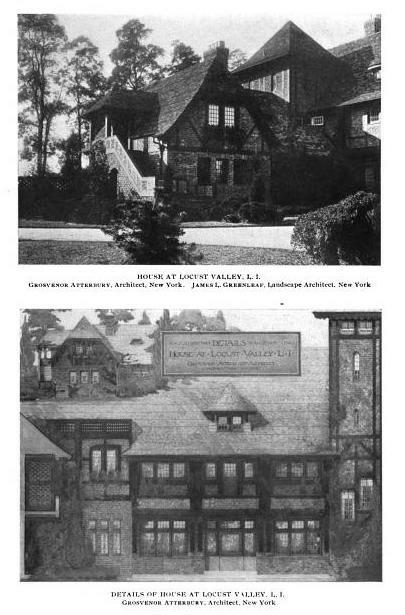 Photo from the Annual Exhibition of the Architectural League of New York, 1908. Wonderful drawing. It shows well Atterbury's talent for pattern. Fascinating to me, because I recently was buried deep in a collection of photos of Byrne's house at Bar Harbor by Guy Lowell, which replaced this one as their country residence, so completely different, in a Tuscan style by Guy Lowell. I wish the house had been rebuilt after the fire. The original house was far superior to the uninspiring successor.